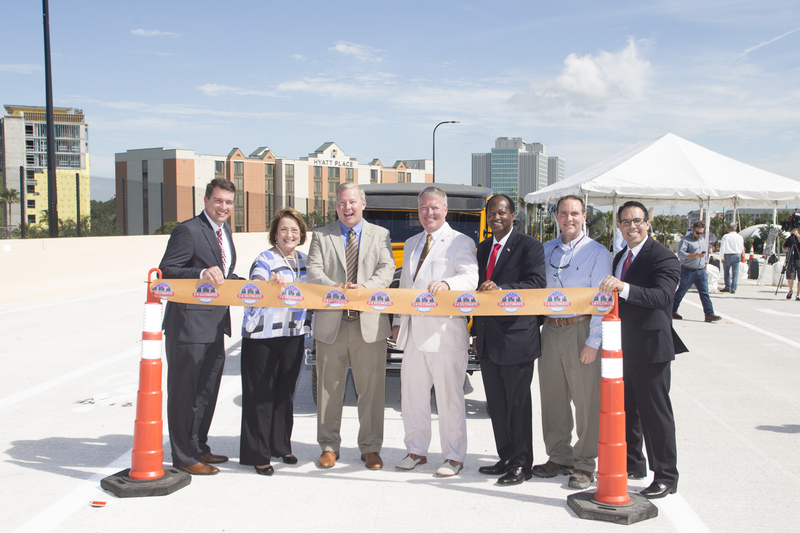 Orange County Mayor Teresa Jacobs and community leaders joined the Florida Department of Transportation (FDOT) for the ribbon-cutting ceremony celebrating the I-4 Ultimate’s opening of the Grand National Drive overpass. The Grand National Drive overpass will also improve traffic operations for drivers, ease congestion and provides a more direct way for motorists to navigate through the tourism district. The overpass also creates a pedestrian bridge over I-4, connecting International Drive to Major Boulevard. The pedestrian bridge gives pedestrians a safer way to walk to local theme parks from area hotels. The overpass features four lanes over the busy Kirkman Road interchange and is designed to accommodate more than 1,000 vehicles an hour. Other features of the overpass include new drainage and landscaping. Widened bicycle lanes and sidewalks have also been constructed to encourage pedestrian and bicycle access for guests visiting the area. 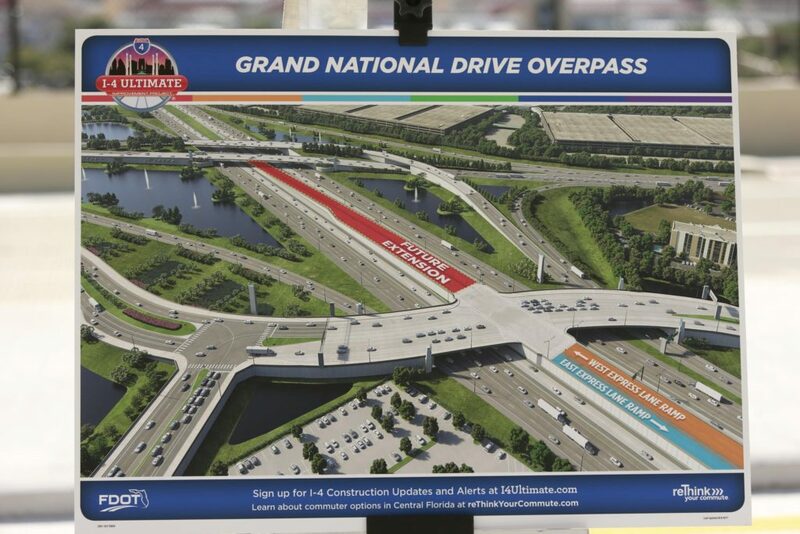 The east side of the overpass will also include Express Lane direction connection ramps when construction of the 21-mile I-4 Ultimate project completes in 2021. Construction for the Grand National Overpass began in August of 2015, taking two years to complete with the improvements. Mayor Jacobs has supported the I-4 Ultimate project since its conception and led the “Beyond the Ultimate” Task Force to explore options for connecting the I-4 Ultimate with Polk and Volusia counties. As one of the most high-profile roadway projects statewide, motorists have begun to experience noticeable changes on the $2.3 billion I-4 Ultimate construction project, a public-private partnership overseen by FDOT, connecting the Tampa Bay and Central Florida regions. The 21-mile improvement project from west of Kirkman Road to east of State Road 434 will also add four new express lanes in the center of I-4. Since the ceremonial groundbreaking in February 2015, the project has moved toward the anticipated need of 2,000 jobs, including 250 on-the-job trainees. While the I-4 Ultimate reconstruction project continues to progress toward completion in 2021, FDOT also is moving ahead with plans for projects under Beyond the Ultimate. The proposed Beyond the Ultimate consists of five different project segments and comprises approximately 40 miles. Twenty of those 40 miles run from west of Kirkman Road in Orange County to just west of the S.R. 25 and U.S. 27 interchange in Polk County. Another 20 miles run from east of S.R. 434 in Seminole County to just east of S.R. 472 in Volusia County. Transformational transportation infrastructure continues to be a top priority Mayor Jacobs. In 2015, Mayor Jacobs announced her INVEST in Our Home for Life initiative, one of the largest infrastructure programs in Orange County’s history. Known as INVEST in Our Home for Life, the $300 million investment program provides for affordable housing, public safety, infrastructure, parks, pedestrian safety, road construction and transportation improvements.